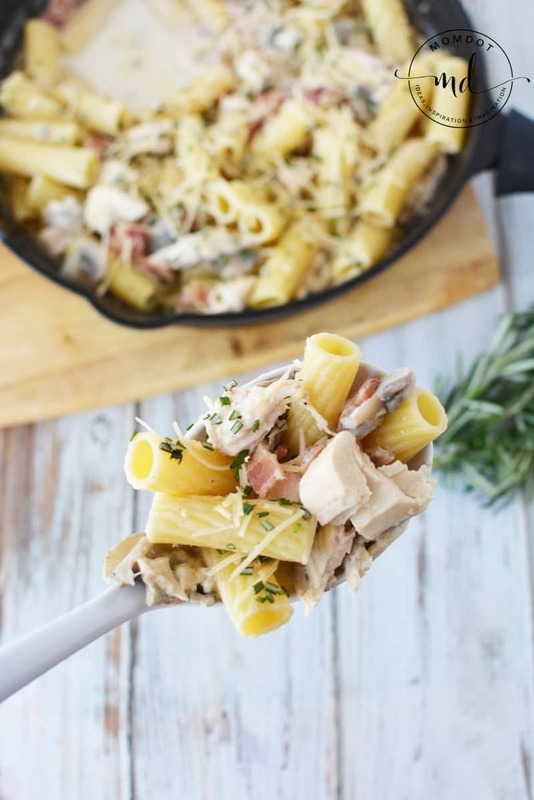 This Leftover Turkey Pasta is a delicious and easy way to use your leftover turkey from Thanksgiving! Of course we all like a great left over sandwich but those can get boring year after year, so let this tasty tried and true recipe tickle your taste buds and make you ready to put one more turkey in the oven when the last bits are gone. 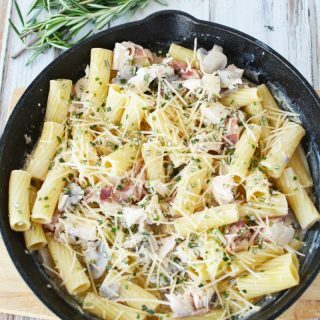 Full Leftover turkey pasta recipe below and printable version on the bottom so make it easy for you to cook in the kitchen. Ready for more meal ideas? Make sure you try Fan favorite Lemon Butter Chicken too! 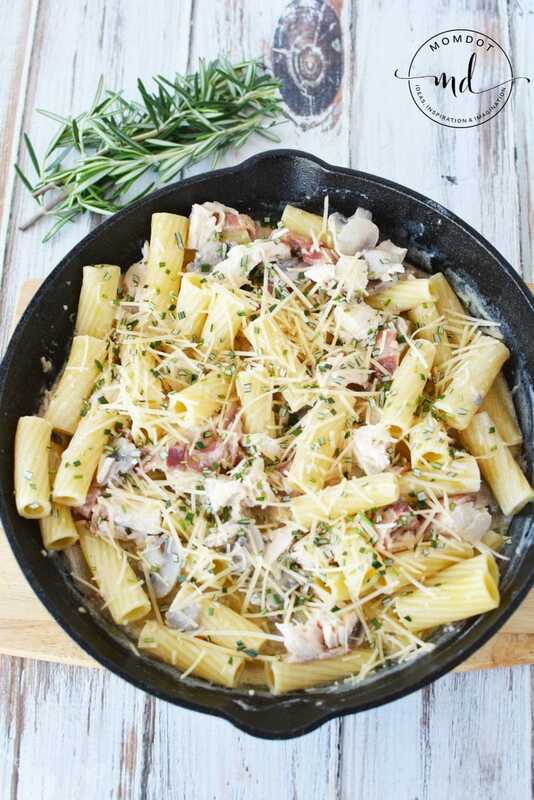 RECIPE TIP: While this is a pasta dish, you can easily leave OUT the pasta and instead add your turkey mixture on top of left over mashed potatoes for another delicious meal! In a large skillet, add butter, garlic and mushrooms. Cook on medium heat for 3-5 minutes or until mushrooms are tender. Stir in bacon, broth, cream and 1/2 cup of cheese. Add turkey and stir well. Bring to a boil and reduce heat and simmer for 5-6 minutes. Remove from heat and stir in pasta. Garnish with remaining cheese and rosemary before serving. Another recipe that makes great left overs is this low carb cauliflower casserole. You can eat it as dinner OR a side dish for days and without tons of guilt! 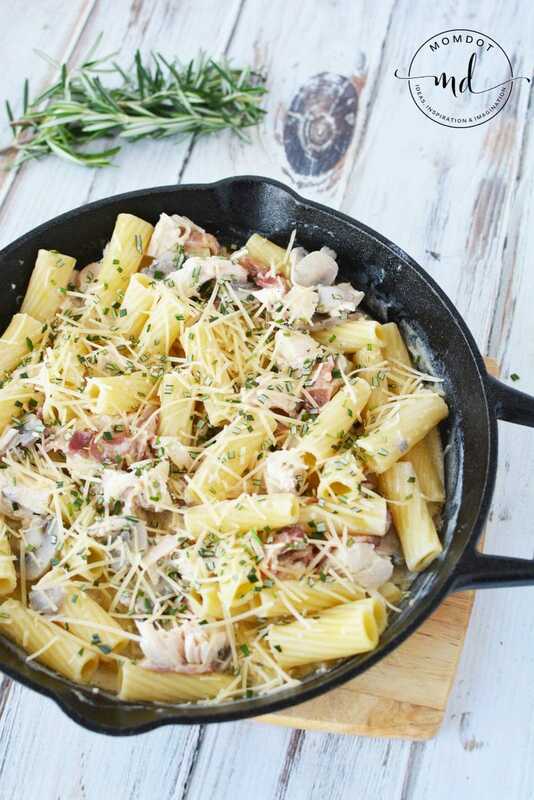 Use your Thanksgiving Left overs for this Leftover turkey pasta dish. Easy to make and so rich, you will love creating this custom meal from all your turkey scraps! In a large skillet, add butter, garlic and mushrooms. Cook on medium heat for 3-5 minutes or until mushrooms are tender. Stir in bacon, broth, cream and 1/2 cup of cheese. Add turkey and stir well. Return to heat. Bring to a boil and reduce heat and simmer for 5-6 minutes. Remove from heat and stir in pasta.